We all want to remain independent for as long as possible. West River Valley Supportive Housing supports that desire. Located in a newly-constructed wing off of the assisted living building, West River Valley Supportive Housing offers the flexibility of independent living with a supportive array of in-house services available for the "what-ifs" of life. These one-bedroom apartments each have a living room, spacious bedroom, private bathroom w/shower, and kitchen with full-size refrigerator, range and sink. See an apartment floor plan here. Residents can purchase a meal a day or a full meal plan from our commercial dining service. They may also purchase weekly apartment cleaning or laundry services. In the event of an emergency, residents have access to in-house professional care staff under the supervision of our Registered Nurses. 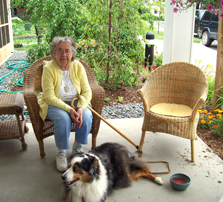 Learn more about our Assisted Living Housing or Independent Living options.